Happy so far, expecting it to stay so. A bandsaw had been on my wish list for a number of years. I had been planning on getting a Rikon 10-325. In February, I heard about the Laguna 1412. While the Rikon was a couple hundred dollars cheaper, I was expecting to want to immediately replace the guides for the difference in price, plus some, it then became a no-brainer. And the Laguna had a mobility kit designed for the saw while the Rikon would need a third party set of wheels. When Woodcraft offered a free worklight with the saw, I stopped by their local store and bought it, light and mobility kit. The unit fit comfortably in my Scion xB (the small one). When I got home I tipped the box out of the car and laid it in front of my shop door (there’s a 9” step up into the shop). The unit is well packed. The table and part of the base is packed on top. The other two base pieces are under the saw. My girlfriend is adorably weak, so I assembled the unit myself. You’ll need metric wrenches/sockets. A 6mm hex wrench is included. You’ll need a 2mm, 4 pr 4.5mm and an assortment of sockets. I was able to walk the saw through the door. I assembled the base and added the mobility kit. I would recommend tightening the wheels at that time. The instructions say to do it later and never mention it again. To attach the base, you need to lay the unit on it’s back on at least 8” of blocking (or have someone help you lift the saw onto the base.) I tipped the top of the saw back out the door. This gave me an additional 9” of leverage when it came time to right the saw. A note about the instructions: The instructions suffer from what I call ESL (English as a Second Language) Syndrome. Which leads to odd sentences, the bolts being called ‘fixings’ and some un-intentional humor (such as “However, you now own a real band saw…”). They are a bit vague in a number of places. You have to figure things out on your own They never mention the quick release lever. You would think the company would hire a native speaker to review and correct the manual. When I attached the base, I found that adding the back bolts first worked much better. I couldn’t align the back bolts if I attached the front bolts. Or have some help (but if you had someone you could have lifted the saw onto the base). Once the bolts were snug, I put a length of 1/2” MDF up against a toolbox to keep the back wheels from rolling while I lifted the top of the machine. I then proceeded to attach the table. It is suitably covered in grease. I did take a scraper blade to side where the fence attaches to remove some crusty something. Afterwards I attached the fence rail. The throat plate is a snug fit. Maybe too snug. The instructions state that it was adjusted at the factory. I found that I had to adjust the jack screws to get it flush with the table. I finished off by installing the light. I would highly recommend to anyone getting the light that you always fold it down when not using it. I bumped my head on it a couple times; once hard enough to need a bandage. My girlfriend won’t be happy. The saw doesn’t come with a blade, so I have yet to try. Will update this when I get blades. They are on order. (I do have a resaw blade, so I may make up an excuse to mount it). I’m going to give the unit 5 stars to start with. I may adjust this as I use the unit (but based on other reviews, I’m doubting it). Update (8/28/15): I’m still very happy with this bandsaw. I’ve done in-numerable circles. Re-sawn a couple 8’ pieces of 8” wide African Mahogany, a bit of walnut, a couple pieces of other types of mahogany. Some pine at an angle for a jig. Ripped a few boards and cut circles out of corners. The only thing I’ve done was the fence isn’t perpendicular to the table for re-sawing. Four or five pieces of Scotch tape along the bottom edge of the fence where it attaches to the arm (you’ll understand if you see it) lined it right up. The thing I couldn’t fix (or haven’t yet) is that when you tilt the table, the fence is on the uphill side of the blade. Would work much better if the fence was on the downhill side. Now that I write this, I’m thinking I might be able to move the fence to the other side of the arm (again, you’ll understand if you see it). Will have to check it out. Thanks for the review – i gave that saw a once over at the store and found the only thing I didn’t like was the placement of the fence lock wheel – in order to open the lower door enough to change the blade you have to slide the fence all the way to the right, otherwise the door hits the fence knob and you can’t open the door all the way. If I had a an extra grand I too would have that saw…. Sweet band saw! Enjoy your new tool. Thanks for the review. 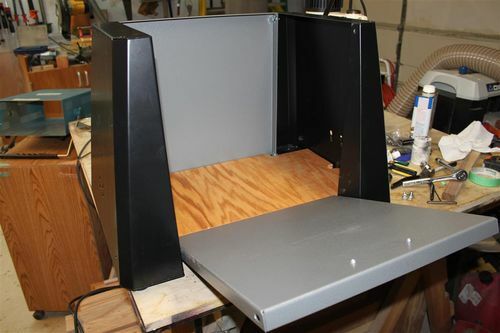 Added a 3/4” ply floor and basically flipped one of the side panels to allow access to the upper bolts, and when they are removed the panel hinges downward for access to the interior of the base. A couple of thin thrust washers separate the lower part of the side panel from the end panel and keep them from rubbing. I plan to replace the bolts with the ratcheting knob type fastener (5/16” will work) so that a wrench isn’t needed. Very nice. I had to move my shop (again) and found all the bolts for the mobility kit were loose. I’m thinking about adding lock washers. I had tipped it on it’s back again to adjust the front wheel bracket. Definitely needed help righting the full assembled saw. I’m still very pleased with the saw. Adjusting the blade guides is a bit tedious. I’m not sure other saws are any better. Someone else will have to comment on that. The light is okay. I would be better if it was mounted on the left side somehow. A well lit shop might alleviate the need for the light kit. I have done some re-sawing, a bandsaw box (which didn’t turn out; not the saws fault) and made some circles with home-made jig. The unit runs smooth. The dust collection port is not quite standard (I don’t remember if it’s too big or too small; too big, I think), so that took more work than it should have. Once it’s attached, you shouldn’t have an issue. whope, Glad it’s working out, mine is finished and operational too, and I sure second the 5-star rating. Might even post a mini-review later this evening, since yours and other reviews have pretty much covered all the details. Rockler’s was out of stock on the mobility kit, so used a different 4-wheel base from them at $39.95. Also skipped the light, but intend to install a different home-built light pretty soon. 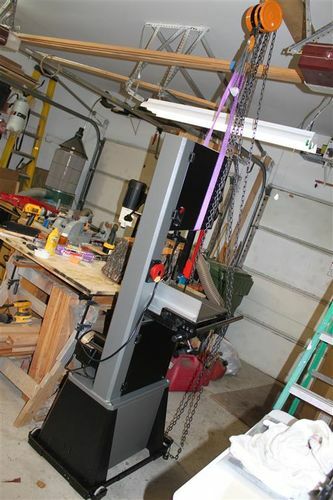 My solution to the lifting the unit onto the base was to install a $49.95 HF 1-ton chain hoist in the garage, turned out very easy to get the beast all assembled, and later on set on the mobile base. A real back-saver! 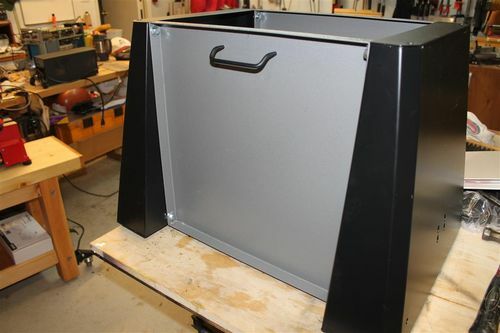 Not sure the access door that I described is very practical either… When the 275lb saw is sitting on the base, the side panel is loaded such that it’s pretty hard to open. The concept needs further development!